Birders weighted down with cameras and binoculars shuffle onto Day’s Catch from the wharf at Seal Cove on New Brunswick’s Grand Manan Island, ready to catch a glimpse of the Atlantic puffins, razorbills, murres, petrels and other seabirds that have been drawing ornithophiles to the region since John James Audubon visited the island in 1833. As the lobster boat-turned-tourist vessel departs, a gull hovers behind it, perfectly still. While most people wouldn’t think of gulls as particularly menacing (unless they’ve had a boardwalk lunch ruined by the dive-bombing bird), there is something ominous about this one, which appears to be hitching a ride on the boat’s draft, trailing it as it pulls away from the island. Perhaps that’s because here in the Gulf of Maine, gulls have garnered a far more predatory reputation, at least among the migratory seabirds that can be found on the islands that dot these waters. Day’s Catch heads southwest on its tumultuous 28-kilometre journey into the gulf, plowing through metre-high swells toward its destination, Machias Seal Island, an eight-hectare flat treeless rock that’s protected by the Canadian government as a migratory bird sanctuary. But as the boat nears the island, cellphones begin to flash roaming alerts, a signal that the passengers have crossed into the United States. Or have they? It’s not entirely certain, because Machias Seal Island is disputed land, a 235-year-old territorial kink between the two nations that they haven’t managed to iron out, thanks to differing interpretations of the American Revolution-ending Treaty of Paris of 1783. Yet there’s no sign of barely simmering international conflict on the island — no fence dividing it down the middle, no patrol boats scudding offshore, no flags duelling in the breeze. 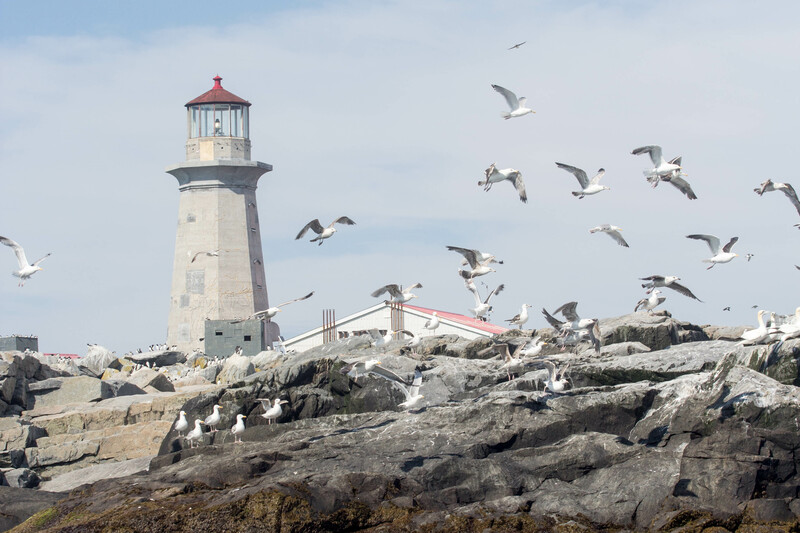 In fact, apart from the birds, there’s not much to see other than the Canadian Coast Guard-administered lighthouse and research station, although the human presence does ramp up during nesting season in June and July, when two boatloads of visitors per day — 15 aboard an American vessel and 15 aboard Day’s Catch — come to see the birds. Still, there is more to this place than it being the answer to a quirky bit of geographic trivia or a very fine place to birdwatch. What most people don’t know is that Machias Seal Island has become the focus of an ongoing debate that has wildlife managers on both sides of the border at odds and could leave the future of one bird species hanging in the balance. Arctic terns are extraordinarily tough. They have to be, considering they make the longest migratory journey of any bird — a round trip of at least 35,000 kilometres from their breeding grounds in the Arctic to their wintering grounds in the Antarctic. But they aren’t exclusively Arctic birds. A pocket of them nest much farther south than the tundra or boreal forest, along the shore of the North Atlantic coast from New England north. One of these places is Machias Seal Island, which was once home to about 2,000 pairs of Arctic terns, making it the largest colony of its kind in North America. Today, however, only about 475 pairs of terns remain on the island, their numbers diminished in large part by the presence of gulls, which hunt tern eggs and have wildlife managers at their wit’s end trying to prevent more losses. They’ve tried everything from destroying gull nests and gull eggs to scaring the birds away using slingshots, paintball guns and a plethora of pyrotechnics. “We tried about every non-lethal method of control we could think of to protect the tern colony, and every method failed,” says Lauren Scopel, a PhD candidate at the Atlantic Laboratory for Avian Research at the University of New Brunswick in Fredericton. We tried about every non-lethal method of control we could think of to protect the tern colony, and every method failed. In 2006, it seemed as if the colony on Machias Seal Island had disappeared. The island, which normally resounded with the high-pitched shrieking of terns protecting their young from predators, went eerily silent as the birds abandoned the nests they had been returning to each year. That they did so was the result of several factors, including a shortage of herring (their primary fatty food source), bad weather during nesting season and the growing problem of gull predation. Lethal control, which had been employed for decades both formally by Canadian Wildlife Service wardens and informally by some of the lighthouse keepers on the island, had been suspended in 2000 by the Canadian Wildlife Service. Diamond says the suspension occurred because of a change in federal long-gun regulations in the late 1990s, which made it impossible to get permits in a timely manner. He and Scopel cite the lack of lethal control during this time as the main reason the terns abandoned the colony six years later. Terns would return and attempt to nest on the island in the years following, but the eggs make for easy food for the gulls without enough terns present to defend them. Until they published a paper in defence of lethal control in 2017, Diamond and Scopel hadn’t widely advertised their activities on Machias Seal Island because they were concerned about the public reaction. But they both say they don’t want to be operating in the shadows anymore. Instead, they want to have a real discussion about the value of lethal control and, more specifically, about how losing it could be the last nail in the coffin for the larger regional population of Arctic terns. Diamond suspects gull predation may have been made worse in recent years because of intensive lobster fishing in the disputed area, which is known as the grey zone. With the price of lobster nearly tripling over the last decade, fishermen from both sides of the border toss their traps into the waters of this zone. The practice has occasionally led to tensions flaring between fishermen, but it has also attracted gulls, which are drawn by the old bait that often gets tossed overboard when the lobster traps are hauled up. Diamond calls Machias Seal Island and the surrounding waters a “subsidized fast food joint” that the gulls are in no rush to leave. Two years after the Machias Seal Island Arctic tern colony failed in 2006, Scopel began working with the Audubon Project Puffin seabird restoration program in Bremen, Maine. She says that in the United States, wildlife managers take a more hands-on approach to managing gulls. “We are not permitted to have a firearm on the island at all times as they do at American colonies,” says Scopel. She believes that if she and her colleagues were able to shoot the “problem gulls” themselves as they are identified, there would be a much better chance at Arctic tern chicks fledging, and likely fewer gulls shot in the long run. “My fondest wish would be for us to have a gun full time,” she says. Brian Benedict, the manager of the U.S. Fish & Wildlife Service’s Maine Coastal Islands National Wildlife Refuge, which encompasses an area around Machias Seal Island, says lethal control of gulls is the most important tool he has to restore and maintain seabird colonies at their historic nesting islands. He says in addition to Machias Seal Island, lethal control was used to restore seabird colonies on Petit Manan, Seal, Pond, Ship and Metinic islands, to name but a few. But Garry Donaldson, the manager of wildlife assessment and protected areas for the Canadian Wildlife Service’s Atlantic region, says that rather than attempting to maintain a population of seabirds at the colony level, the Canadian Wildlife Service is currently looking more broadly at the marine ecosystem as a whole. His concern is that encouraging birds such as the Arctic tern to stay on an island that no longer favours the population creates an ecological trap. 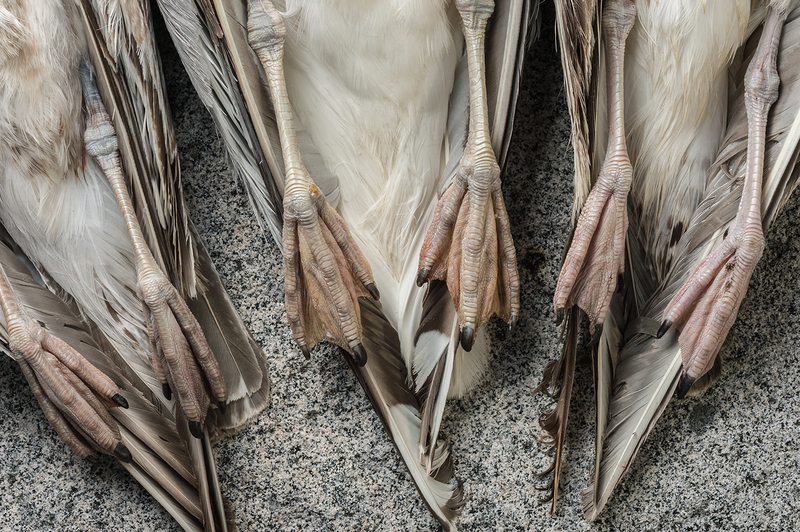 Watch: When is it okay to shoot a gull? The first thing the passengers on Day’s Catch hear as the boat approaches Machias Seal Island through the fog is the high-pitched shrieking of terns. The birders transfer to a skiff and circle around the island, stopping to gawk at each new species they pass. First it’s the gannets, standing tall on outer crevices. Then it’s the razorbills, gathered by the lighthouse. Then it’s the Atlantic puffins, which take clumsy flight as the boat gets closer. Turning a corner, the skiff passes a rocky cliff where four birdwatching blinds stand. Finally, someone spots the Arctic terns, which are so small and fast it’s a challenge to follow them. These birds weigh little more than a bar of soap, but they’re robust enough to travel tens of thousands of kilometres every year. Could they be tough enough to survive on Machias Seal Island — with people’s help — and fledge their young after so many years of failure? Or will they move on, abandoning instinct and relinquishing this slab of rock to the gulls?